UPDATED: The House’s most sweeping attempt at tax reform this year passed on a preliminary vote on Tuesday after hours of at times acrimonious debate. House Bill 500 which would spend an estimated $667 million over the next biennium. The House’s most sweeping attempt at tax reform this year passed on a preliminary vote on Tuesday after hours of debate that was at times acrimonious. But House Bill 500, which would spend an estimated $667 million over the next biennium to reduce the burden of the state’s franchise tax on businesses, still faces an uphill climb in the Senate, where lawmakers have raised concerns about its cost. And its place in the state budget is up in the air; budget conferees would have to work out these details if the bill, which is expected to be carried in the Senate by the upper chamber’s finance chair, Tommy Williams, makes it through. When HB 500, authored by state Rep. Harvey Hilderbran, R-Kerrville, first hit the House floor, it spent nearly $400 million over the next biennium. But hours of amendments filed by both Republicans and Democrats — some reducing the tax burden on individual taxpayers and small businesses, others benefiting specific industries, from insurance to hospitals to oil and gas — raised the total by hundreds of millions of dollars. For some Republicans, the pricetag was a source of consternation. For Rep. Sylvester Turner, D-Houston, the tally grew far too high. In one particularly heated exchange, Hilderbran and Turner disagreed on how the bill could affect education funding. Turner said it’s an undisputed fact that the franchise tax raises money for education and that the bill’s tax relief would ultimately reduce money for schools. Hilderbran disagreed, arguing that his tax cuts would strengthen the state’s economy and thereby increase Texas’ overall tax revenue. The remark, referencing Hilderbran’s stated interest in running for comptroller, briefly stunned the House into silence. Turner apologized for his remarks. The bill survived a few attempted points of order — legislative technicalities that could’ve derailed it. State Rep. Yvonne Davis, D-Dallas, lodged one unsuccessful attempt — and after it failed, expressed deep reservations about the measure. The budget the House passed “represents what’s good for Texas. It may not be what everybody wanted, but there was a lot of give and take,” she said. “… For us to have a bill before us that could cut into that process is just unconscionable." "It's a very important part of our agenda this session to make the margins tax fairer and simpler but also give relief to our taxpayers," Hilderbran said in a video he posted last week promoting the bill. Hilderbran chairs the House Ways and Means Committee, which oversees tax issues. The Legislature created the tax in 2006, during a special session, to pay for a property tax cut and address inequities in the school finance system. Ever since, businesses have described it as burdensome or unfair. To make matters worse, the tax has never raised as much as was originally projected, creating what some have described as a “structural deficit” in the state budget. Many Republicans and even some Democrats dislike the franchise tax enough that they would rather do away with it entirely rather than just tweak it. The franchise tax raised $4.6 billion in the 2012 fiscal year, 10 percent of total state taxes raised, according to the Texas Legislative Council. It’s the second largest tax levied by the state after the sales tax, which makes up just over half of the state’s tax revenue. Gov. Rick Perry has threatened to call a special session if he does not see “significant tax relief” this session. He has proposed $1.6 billion in tax cuts, including a broad 5 percent cut in franchise tax rates. Hilderbran’s bill addresses some perceived inequities in the law, such as complaints that it taxes independent auto repair shops differently than those based in a car dealership. 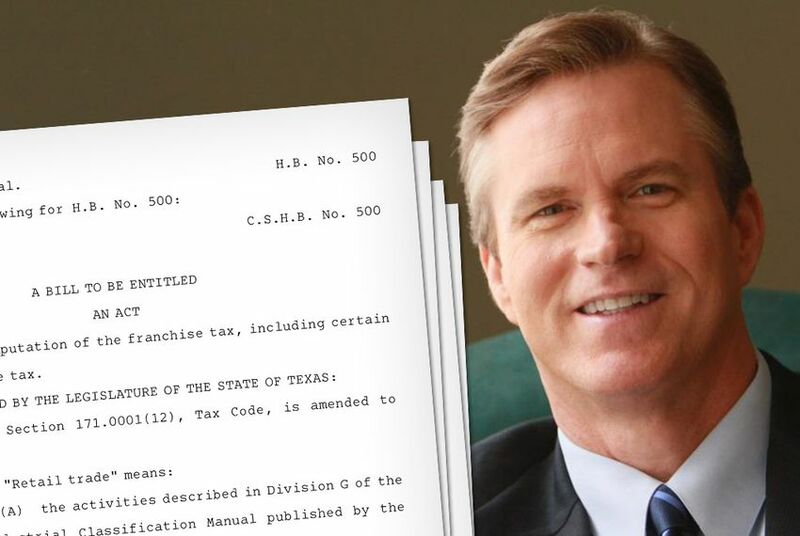 The Texas branch of the National Federation of International Business is among the business groups supporting the narrow tweaks in HB 500 even though they have also lobbied this session for the franchise tax’s outright repeal. “This legislation is a significant gesture to the community of business owners who have survived a recession, as well as overtaxation and overregulation at every level of government,” NFIB/Texas said in a statement last month. Yet some argue that the state can’t afford more tax breaks while it is having trouble finding funds for needs such as school funding and transportation. Texas Forward, a liberal coalition of education, labor and health-focused groups, recently criticized state leaders for their advocacy of tax relief measures this session. “Texas needs to scrub the tax code of outmoded and wasteful tax breaks instead of giving away even more revenue,” the group said in a statement. By Monday, House members had pre-filed 33 amendments to HB 500. Some would increase or add exemptions to the franchise tax for specific industries including health care providers, concrete manufacturers and movie theaters. An amendment from state Rep. Yvonne Davis, D-Dallas, would direct the comptroller to study the economic impact of every tax exemption on the books and require the Legislature to periodically vote to keep each exemption from expiring. Hildebran has several proposed amendments for his own bill including one that would exempt businesses that relocate their headquarters from another state to Texas from paying the tax for three years.